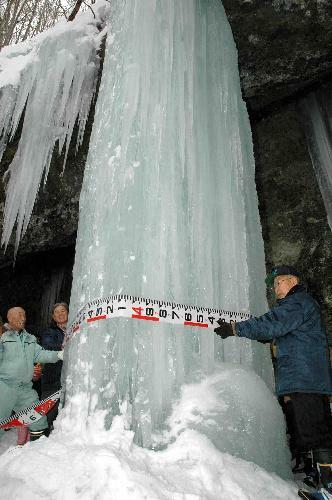 In a tradition that stretches back 700 years, local farmers in Hanamaki, Iwate prefecture measure the circumference of the frozen waterfall at Taroshi Falls to predict the yield of the year's rice crop. According to the conservation group that has kept track of the measurements since 1975, the largest measurement on record is 8 meters, taken in 1978. Warm winters in recent years have caused the ice to break apart, sometimes making it impossible to get an accurate measurement. This year, however, the frozen waterfall measures in at a respectable 5.5 meters, surpassing the 4-meter mark that indicates a plentiful harvest. Hiroshi Itagaki, 74, head of the conservation group, says, "With all the depressing news about this year's heavy snow, I hope this can serve as a message of hope for the country." The conservation group's mantra is a haiku which translates: "So magnficent -- this icicle before us -- bulging with promise." Wow! That's the longest and thickest icicle I've ever seen.In Staten Island,New York we have an unstable icicle that's hanging off our gutter that's close to 6 feet tall,but that is just truly amazing!